SeeSAR 7.1 has just been released. 3D-pharmacophores to identify compounds of interest By now, you can run so many bulk actions, your solution list will grow by the minute. This made it just the right time to implement another filter option to help you keep track! Pharmacophore filters can now be defined using so-called sphere constraints. You can apply these pharmacophores at lightning speed to the molecule table and drill down solutions sets quickly and effectively with queries such as: Which molecules have an acceptor at this position? Filter out molecules that occupy this position! Give me all molecules with an aromatic moiety here! 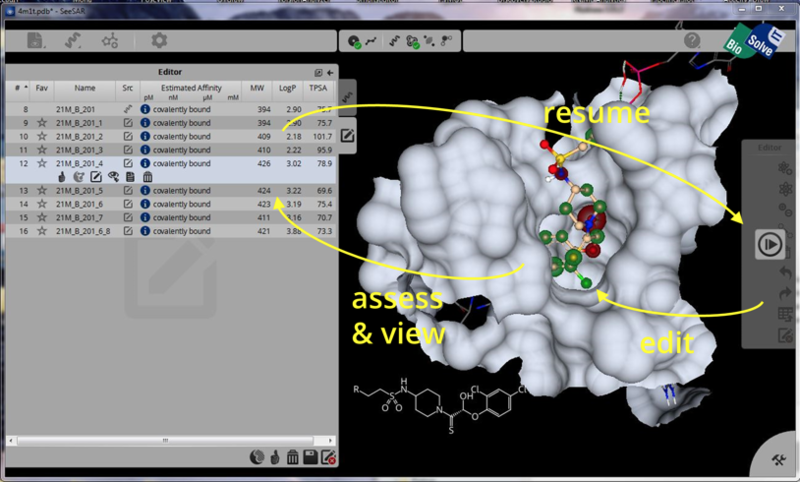 Linking and merging fragments with the integrated ReCore It is now possible to enter the 3D molecule editor with more than just one molecule. Among other things, this facilitates linking and merging operations with ReCore. Simply select the atoms you seek to replace (eg the terminal atoms of two fragment binders that should be linked). A click on the ReCore button retrieves for you in seconds fragments that link the two binders, leaving them as closely as possible in place. Better measure and label-options (with adjustable font size) Partially hidden labels in 3D won't bother you anymore! Instead, the simple labels for showing distances, angles, and so on have been upgraded to the more advanced labels which we have always used for Hyde and more recently for displaying torsion information. These labels are movable (simply click and drag) and are always at the front. Plus, as a bonus feature, you may now also adjust the font size on the labels in the appearance settings menu in the toolbar. Parallel high-throughput docking A lot of users have been waiting for this feature! Now bulk docking can be carried out with just one click. Plus we have parallelized the docking calculation so that it now uses all processors on your computer, providing you with solutions swiftly — just as your hardware permits. Multiple selections for bulk actions Frankly speaking we previously "abused" the favorite icon for making selections to initiate bulk actions. This itself undermined the point of being able to mark molecules as favorites. Now you may conveniently select multiple molecules using the new check box feature, and initiate bulk actions on the basis of this selection. For your convenience we also added a few functions to make working with these selections even more effective (un/check all, invert, ...). Just as for the favorites, shift + left mouse click works on the check boxes as a multiple un/check feature. By default, the proteins chains are colored according to the same coloring scheme as before, with each chain in a different color. In the protein table you may set a unique color for a protein to ease identification that will be used for all components of that protein. If you edit a protein, the edited version of the protein will simply be appended to the table without overwriting the original. It is of course also possible to delete proteins from the table. Finally, you may choose the protein to be used for defining a common binding site from the table, just click the icon to start the binding site definition. Once a common binding site has been defined, a little binding site icon indicates which protein was used. Note that only this particular protein is used for the generation of poses, as well as for optimization and affinity estimation, i.e. the Hyde atom coloring on molecules is shown with respect to this protein. Once a common binding site has been defined on one protein, the binding site itself is shown in greater detail. Now however, the regions of the other proteins in the vicinity of the common binding site are also shown in greater detail. This allows you to see the detail you need when seeking out differences or commonalities but the view may, however, become a little crowded. 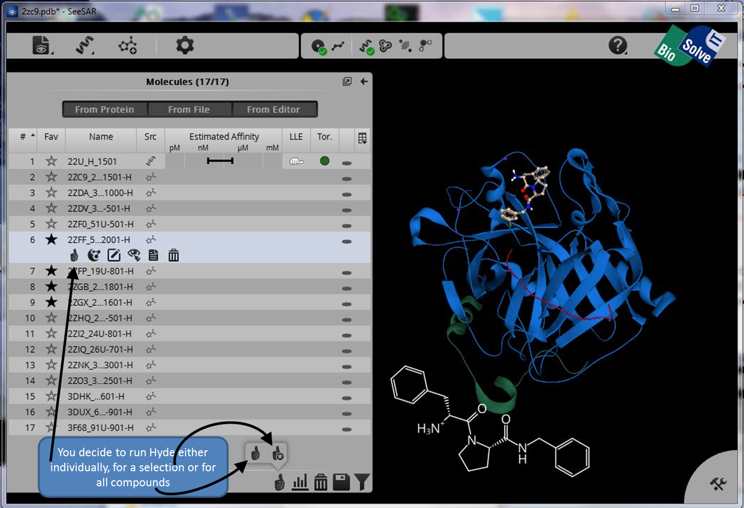 An enhanced menu under the protein visualization icon allows you to switch on and off different protein components (secondary structure, binding site amino acids, ligands, waters and metals) individually or as a group, and you may also change the visibility of entire proteins at once, all making handling of the view very flexible depending on your needs. We have fixed some seldom occurring but still irritating issues with the 3D editor and also implemented the possibility to restrict the number of CPUs that SeeSAR may recruit for its computation on the command line. The option --thread-count allows you to limit the number of parallel compute threads as best suited. This feature is particularly useful if you run SeeSAR on a cluster which is controlled by a batch queuing system. There is a review of an earlier version of SeeSAR here. I've just added a review of MOEsaic, this is a web service application that is part of the MOE install from Chemical Computing Group. MOEsaic is a browser-based application for analyzing series of small molecule chemical structures and related property data (e.g. from medicinal chemistry projects). Once structure-property data is uploaded to the server, MOEsaic allows users to perform structure based searching and data analysis. There is a complete listing of reviews here. There has been a new update to SeeSAR, this latest update brings. While the molecule table offers great functionality for prioritizing compounds based on the data, it does not provide an overview of the molecules themselves. This release, however, sees the introduction of 2D molecule browsing. The table now offers two views - the one you already know and a 2D browser - flick between them using the switch below the table. Both views are always kept in sync so if you add a filter or sort etc. the 2D browser will show you the same result in the same order as the table. Also try expanding the table area to see how more molecules fit into the view. This release also brings with it some great new 3D graphics improvements. As much as we all like visualising the binding site surface, it lay often times in the way… The binding site surface can now be switched to transparent allowing you to see through it and therefore making the analysis of the binding site and molecules within much more comfortable. Also, the feeling of depth in the 3D view has been improved to help orientation - a so-called "fog effect" fades out the protein and molecules that are further away to bring the foreground more into focus. So far, labels on binding site components unfortunately disappeared when browsing through different molecules in the table. Now amino acid, co-factor and water labels remain present if you change to a different molecule in the 3D view and even if you enter the molecule editor. The view of the reference compound has also been improved. For better visibility, the thickness of the bonds has been increased and instead of coloring the whole molecule in a uniform blue color, only the carbon atoms are colored blue so that hetero atoms can be distinguished more easily. There is a review of an early version of SeeSAR here. SeeSAR is a software tool for interactive, visual compound prioritization as well as compound evolution. Structure-based design work ideally supports a multi-parameter optimization to maximize the likelihood of success, rather than affinity alone. Having the relevant parameters at hand in combination with real-time visual computer assistance in 3D is one of the strengths of SeeSAR. One of the issues for machine learning models in helping understand structure activity relationships (SAR) is providing a nice chemist friendly visualisation. This excellent blog post provides a description of how to colour code the parts of molecules that are predicted to contribute to an activity. Optibrium have announced the latest update to the StarDrop application. The highlight for version 6.3 is perhaps the integration of SeeSAR an intuitive structure-based design tool. The new SeeSAR module for StarDrop provides a state-of-the-art and scientifically rigorous approach to understanding the binding of compounds in their protein targets in 3D. Users can import ligand and protein structures, derived from crystal structures or predicted with any docking software, and visualise the key interactions driving potency. 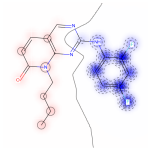 This is seamlessly linked to StarDrop’s chemoinformatics methods based on 2-dimensional (2D) compound structure and its unique Card View approach to interpreting the resulting structure-activity relationships. 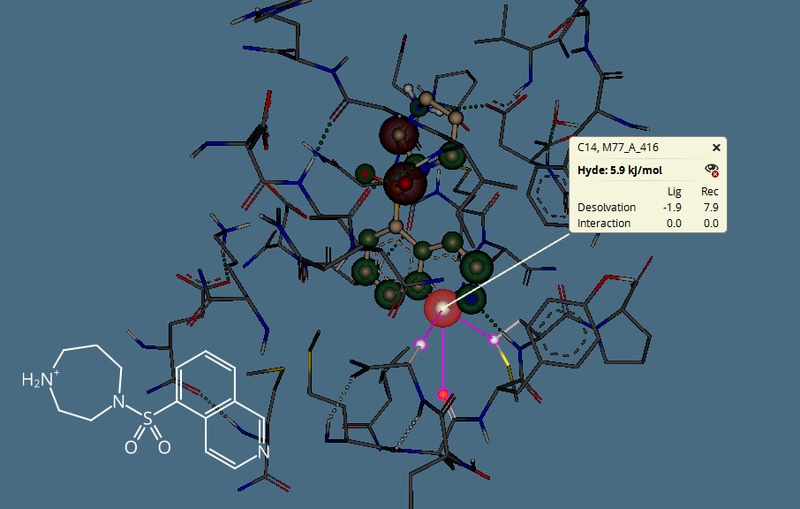 A preview of StarDrop 6.3 will be on show at the American Chemical Society National Meeting, 13th-17th March 2016. There are reviews of SeeSAR and StarDrop in the reviews section. SeeSAR from BioSolve-it has just been updated, SeeSAR is intended as an interactive tool for designing/improving ligands for drug discovery. This update includes an option to highlight the neighbouring atoms that lead to a particular hyde-score, in the example below the carbon in the ring that gets a pretty big red (unfavourable) score, can be explained by the Receptor desolvation penalty ascribed to the carbonyl oxygen. stereo hardware support (as a first step supporting the polarized-glass-type only), a screen shot feature, an option to move labels out of the way for a better view. Sentira is a new chemical data visualisation tool from Optibrium. The focus is on ease of use data visualisation and as such is probably targeted at the bench scientist rather than a specialist computational scientist. It supports a selection of plotting and SAR tools. I’ve written a review of my first impressions. There is also a list of data visualisation applications here. DataWarrior is a data analysis tool that understands chemistry, it provides an efficient way to search, sort and analyse structure-activity data. DataWarrior was developed at Actelion and it is highly integrated into the drug discovery platform, in 2014 it was decided to release DataWarrior without the integration layer as a stand-alone tool to the public. DataWarrior is a Java application and thus is cross platform. I’ve written a review on my initial impressions.